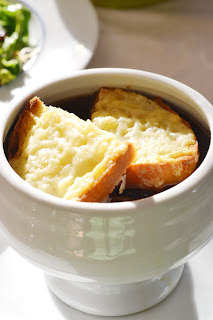 As I mentioned in my last post, all of my posts this week will be French--today is French Onion Soup! I love French Onion Soup, but as a busy mom with a full-time job, I just don't have the time to stand over a pot caramelizing onions for hours. So what do I turn to? My trusty crockpot, of course! I use my crockpot a lot in the winter because, obviously, it makes great soups and stews. It's also great in the summer when you don't want to turn on the oven and heat the house even more. 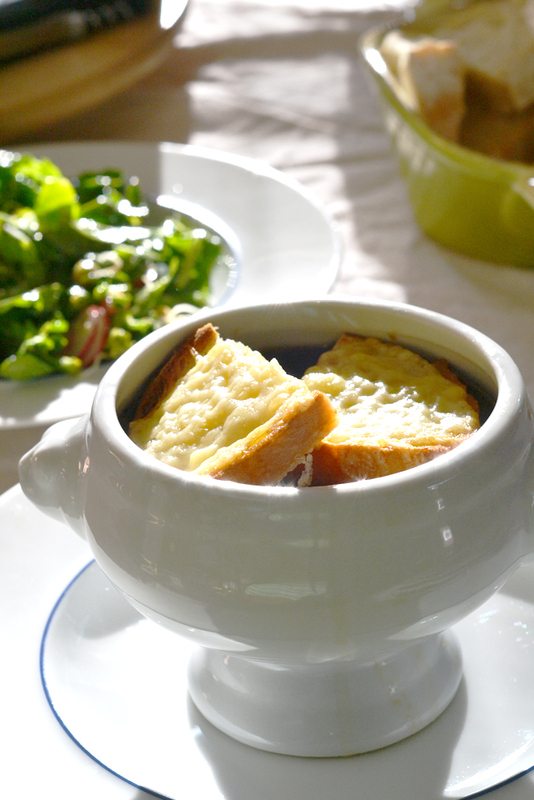 French Onion Soup is great in the winter or the summer--in the winter, I pair it with a grilled cheese, but in the summer a nice light salad does the trick. I like to make cheese crisps to place on top of the soup instead of melting the cheese on the bowl under a broiler. All you have to do is slice some French bread, top it with a pile of finely shredded gruyere or other Swiss cheese, and place it under the broiler until the cheese is all melty and starting to brown. Ladle the soup into the bowls and top with the cheese crisps. Voilà--a simple and very French meal! Turn your crockpot on to high. Place the onions in the crockpot and toss them with the olive oil. Lay the bouquet garni under some of the onions. Cover and cook for about 8-10 hours or until the onions are caramelized, but not burnt. Add the broths and marsala and cook for another 20 minutes or until the soup is hot. In the meantime, pile some of the cheese on each piece of bread and place them on a baking sheet. Place the baking sheet under the broiler for a couple of minutes until the cheese is melted and starting to turn brown. Remove from the broiler and set aside. Ladle the soup into bowls and top with cheese crisps. 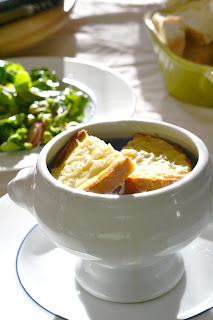 This is one of my husband's favorite soups and close to the top for me as well. It's such a simple thing to make, I don't know why I don't do so more often. Your's looks beautiful! Yum! I love crock pot recipes. I will have to give this a try. PS - I tried to follow you on twitter but the button keeps telling my you don't exist.